My name is Tony Redington and am a resident of 20 North Winooski Ave., Burlington, VT. I am not a car owner and move about the City all year on foot and by bicycle and public transit. Am an active member of: Neighborhood Planning Assembly 2/3 (NPA 2/3), the Burlington Walk Bike Council (BWBC), Safe Streets Burlington (SSB), the Pine Street Coalition PSC), AARP Vermont Livable Communities Group, and the National Association of Railroad Passengers (NARP). Also a member since the formation of the Vermont Bicycle Pedestrian Coalition (VBPC) in 1993, now merged into Local Motion (LM) in Burlington. First, some general comments on the draft “Chittenden County Active Transportation Plan” (ATP) produced by the Chittenden Regional Planning Commission (CCRPC). With exception of perhaps a few blocks (and no intersections) for bicyclists along Dorset Street and the four blocks and adjacent street sections (but not intersections) of the Marketplace for pedestrians, there is not a walkable/bikable transportation facility in the County along busy streets (collector and arterials). (By transportation facilities in these comments, it is meant a facility must be available 24/365 with lighting and winter maintenance--and possess for other than local street sections, all-modes safe connectivity, i.e., in most cases modern roundabouts or strong traffic calming at intersections.) Also important, because there are no safe busy intersections for the walk mode other than the Marketplace and none for the bicycle mode, there are no “low stress” corridors of two or more blocks because there are no “low stress” intersections. The ATP top rank of a “1” for “low stress” remains truly a mirage in our County. The term “mirage” for walkable and bikable is not an overstatement of current conditions. Burlingtonians point with pride at the Church Street Marketplace completed over three decades ago in 1981. Meanwhile the current Walk Bike Master Plan uncovered an ugly set of intersections pedestrian injury data. Every single intersection along South Winooski Avenue from Pearl Street to Main Street made the “dirty 17” pedestrian crash list with at least one injury per year 2011-2014. How disturbing it is that perhaps the safest stretch of street--the Marketplace—has a parallel street where every single intersection is high pedestrian injury crash site—a true street Dr. Jekyll and Mr. Hide in parallel streets!. a. in a 52 year span Vermont roundabouts recorded one non-serious pedestrian injury and four minor car occupant injuries. Pedestrian injuries rate for the five roundabouts was under two injuries per century for each intersection. b. Burlington at 17 intersections (13 signalized) experienced almost one injury per intersection per year (0.9). Pedestrian injuries rates (which included one fatality) for the 17 intersections currently average 90 injuries per century for each intersection. Vermont and U.S. walk and bike injuries are on the rise and our rates of injuries and fatalities for healthy modes are about three times that of urban Germany and the Netherlands where a large cross section of the population bicycles compared to mostly young adult males bicycling here in Vermont (about two thirds male nationally). Bicycling and walking safety is serious business but one would not know it by reading the draft ATP. The five most recent urban fatalities in Burlington/South Burlington occurred at signalized intersections (three pedestrians, two drivers and a cyclist). Nowhere in ATP is the “problem” of bicycle and pedestrian safety identified, discussed or addressed in a quantitative manner. When U.S. Secretary of Transportation Anthony Foxx earlier this year announced the new walk, bike, and motor vehicle safety management requirements for state agencies and metropolitan agencies like CCRPC, he went out of his way to express concern for the increase in walker and bicyclist deaths in America. The paper presented in 2010 contains an addendum, an evolution of the CTRF 2010 classification. It turns out the roundabout—long prized for its safety benefits for car occupants—promises nearly the same level of benefit to the cyclist as the cycle track era has emerged and bicycle accommodation in roundabout design marked evolved. Clearly, the modern roundabout with a 0.1 “crash modification factor” (i.e., reducing the rate of injuries by about 90% in the single lane format for each mode) which can be applied to walk and properly designed accommodations for cyclists. In the one lane format the roundabout represents a no-regrets approach to addressing absolutely deplorable injury rates now for those who walk and bike (much less to those who occupy motor vehicles) in our County. AARP supports converting signals to roundabouts for safety. Dan Burden in his Burlington AARP livable communities workshop in 2014 calls for all roundabouts along the lower Pine Street corridor (from Pine and Maple Street southward). Burlington's land mark North Avenue Corridor Plan with a goal of a world class, safest for all modes 2.8 mile street calls for at least three of seven signals replaced by roundabouts and cycle track (dooring free) end to end. (Did not see dooring free lanes addressed in ATP—perhaps it is there.) These reports and recommendations and plans can be identified or at least be annotated in the report. The absence of any mention of the Champlain Parkway current design in the draft ATP also speaks volumes as the current design would significantly increase both bicycle and pedestrian crash numbers, not only from increased rates of exposure in the South End of Burlington but in great part from introducing four particular traffic signal systems—Sears Lane/Parkway, an entirely new pedestrian intersection; Flynn Avenue/Parkway where a T sign-control intersection becomes a more dangerous signalized cross intersection; and converting two four-way stop intersection--viewed as the safest sign or signal control approach—to quite likely a far more pedestrian crash producing signalized control. To advocate in a government policy document residents to walk and bike without addressing the fundamental lack of safety for these modes on busy County streets from lack of proper and safe infrastructure in effect recommends our residents—young and old—undertake activities known to be hazardous to our collective health. Five corridors of three or more roundabouts in Vermont are in various stages of development: North Avenue, planning stage; Putney Road, Brattleboro commercial corridor, 5 roundabouts, in final design stage; Manchester, one built and one partially in place; and Montpelier, one built, one in design and two others in plan stage. Chittenden County outside of Burlington lags Vermont terribly in highest safety level intersections for all modes—the roundabout, the “intersection safety belt” (obviously in regard to walk and bike modes applicable in this draft ATP). In short the draft ATP calls for the County to continue its devolution of walk and bike safety while major Vermont towns and cities as well as Counties pass our Chittenden County by in walkability and bikability. Even Bennington County—home in a recent report to 30% of the high accident top 100 statewide intersections list by the Agency of Transportation--this very day has it first roundabout under construction as the entrance to its new Walmart. a. Install at least one all-modes low-stress intersection (primarily single lane roundabouts) in each County City and Town Center. Page 7 Conclusions of Existing Conditions Assessment. First sentence: Chittenden County is making great strides in advancing its inventory of bicycling facilities.” This statement is a flat out lie. 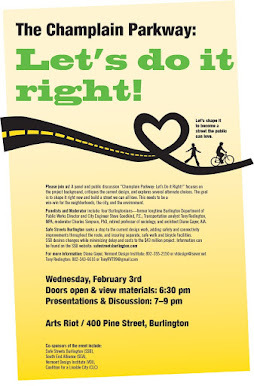 Suggest the following: “Chittenden County first and foremost needs to make it first significant strides In advancing an inventory of low-stress bicycle facilities.” The only low-stress transportation facilities in the County (versus seasonal facilities) are cycle track on a section of Dorset Street in So. Burlington and some multi-use facilities, such as the Kennedy Drive between Dorset Street and VT 116. Would suggest a listing of these and perhaps others I may not be aware of somewhere in the report. By definition “low stress” would include cycle track and roundabout intersections (such as the Burlington Shelburne Street roundabout design) where a cyclist has a choice of “taking the circular travelway” and/or a separate pathed (Assen, NL design preferred). Other than “low stress” facilities the vast majority of those able and willing to bike do not and cannot (safely) bicycle in the County. Year round facilities, of course, mean both adequately lighted and plowed (similar in nature to the Montpelier East and West Bikepaths now scheduled to be connected by a one-lane Main Street roundabout). These comments are consistent with the Illinois State Bicycle Facilities Plan (2015). Page 7—Last sentence: “....and safer walking and bicycling” More walking and bicycling within the County does not necessarily result in “safer walking and bicycling.” More bicycling without sufficient walk facilities can lead to more congestion and lack of safety for the walk mode. Probably not the most important comment—but the connection is very weak. Page 12--Crash Frequency: Bicyclists and Pedestrians First, pedestrian safety and needs always end up last in consideration but always should be first. Everyone walks and must walk at certain points. Same cannot be said of bicycling. The entire emphasis of this chart misleads. There is a general level of unacceptable frequencies of crashes for each and every mode in the County because of the lack of safe infrastructure—sidewalks and cycle track on busy streets and all-modes safe intersections (mostly roundabouts). With a downtown frequency of only one pedestrian crash in over a half century (five roundabouts in Manchester, Middlebury and Montpelier) and just four minor car occupant injuries at those same intersections—any busy intersection with a disabling injury per decade or so for any mode operates at a questionable level and requires attention, placed on a list and prioritized for conversion to low-stress, safe status. Page 13—Public Input: Charettes and Wikimap Since the County does not have a low-stress busy intersection or bicycle street cycle track (excluding the three Church Street Marketplace intersections for the walk mode and cycle track along Dorsett Street for bike mode) holding charrettes and interviewing local residents of the County hardly represents public input. A 2004 charrette in Montpelier about City needs came up with two—more roundabouts and a bus circulator service (both implemented with one additional roundabout in place and at least two more on the way). Page 13 represents at worst planning malpractice. Page 14 Public Input—North Avenue [Burlington] The reference to North Avenue needs to addressed at some point by referencing the North Avenue Corridor Plan which calls for car-free cycle track from end to end of the corridor and converting at least three of seven signalized intersections to roundabouts. Suggest a note number or asterisk with this information suggesting that concerns already addressed. Page 19 Level of Traffic Stress This appears to be mis-labeled as it appears to be a discussion of bike facilities not walking facilities. First paragraph talks about low-stress really being low-crash rate prone in order for all able to bike willing to bike—but then the safety aspect gets lost in research jargon—the Minetta model never is really explained. Page 20 Stress Examples for Cyclists This misleads as it shows a recreation path—clearly without lighting for night use and very likely in a snow climb unplowed (like all County bikepaths, I believe). Page 21 Level of Traffic Stress in Chittenden County This is very misleading as it appears to continue to count recreation (seasonal and/or unlit) paths as part of the transportation network. Certainly such a network can be described but it must be identified as such with a second map showing a year round network. One can argue also that multi-use paths even if plowed/lighted do not qualify for LS 1 status with moderate to high traffic (note Riverside Avenue in Burlington in this regard—also with a high crash section for pedestrians). Note, again, this map should be labeled for road sections/street sections only a there are no bicycle LS 1 intersections in the County (versus, say the Cambridge, Hyde Park, and Morrisville roundabouts along VT 15 in Lamoille County). Page 22 Level of Stress About the same comment as on Page 21—no low stress intersections along busy routes for any mode—cure like that proposed and rejected for Taft Corner and US 2/Industrial Drive in Williston, roundabouts of course. Pages 23-32 Developing a Regional Network The description of a “walking” as well as a “bicycling” network for the County as a whole probably, really, a bicycle network not a walk network. Walking trips of more than a 1,000 to 1,200 feet (maximum for access of public transportation) likely represent the reach or extent for determining a “walk network” and connecting to an adjacent “walk network.” A countywide approach really does not represent any kind of a useful tool or policy makers. a. “Separated facilities”--this should be balanced in the same sentence with “and continued installation of all-modes safe intersections, i.e., roundabouts” along prioritized corridors and nodes” These investments would be primarily “town centers and arterial streets” benefiting primarily the walk mode and secondarily the bicycle mode. c. Address once and for all the Winooski Circulator by installing two two-lane roundabouts (a “dog bone” design) with diameters of about 130-140 feet to improve traffic movements, all modes safety, and shifting unused “dead space” inside the Circulator to useful park/plaza/cafe space to the outside. Again, though little used, ped/cyclist actuated signals for crossings. d. A recreation path along the Circ should come second to converting VT 15 signalized intersections to roundabouts accommodating cyclists—most all would be single laners. Pages 38-44 Non-infrastructure Recommendations These pages on enforcement, education, education and engineering all rest on a deep level of lack of safe infrastructure quicksand. The ideas and program elements sound fine until one goes out and tries to bicycle and walk on busy County streets and negotiate actual intersections. As the architect of Copenhagen's program for reaching 50% of all trip by bicyclist said succinctly: “start with infrastructure first.” The draft ATP does not even address infrastructure in a tangible manner. Pages 45-46 Next Steps The “next steps” can only follow and rest on a rationally thought out plan. ATP is not a rationally developed plan so the next steps really have little or no meaning. Finally a last comment on the size and scope of walk/bike safety investments facing us in Chittenden County. There are three major threats to life and limb for our residents from early adulthood through early middle age. Each nationally amounts to about 30,000 deaths yearly: highway crashes, gun violence, and in recent years the drug deaths, i.e., the oppiad epidemic. Each of these areas involves public policy and investments to reduce deaths substantially. In the case of highway fatalities and injuries—and our concern here is primarily for those who walk and bike—the investments required in our County certainly reach hundreds of millions over the next decade. This is the level of investments already undertaken in the past in Western European nations mostly over the past 30 years as the U.S. once first in highway safety in 1990 now rests at 19th—with 13,000 excess deaths based on the rate achieved by the current leader (we were once co-leader with them in 1990), the United Kingdom. Thank you for the opportunity to comment on this draft plan.